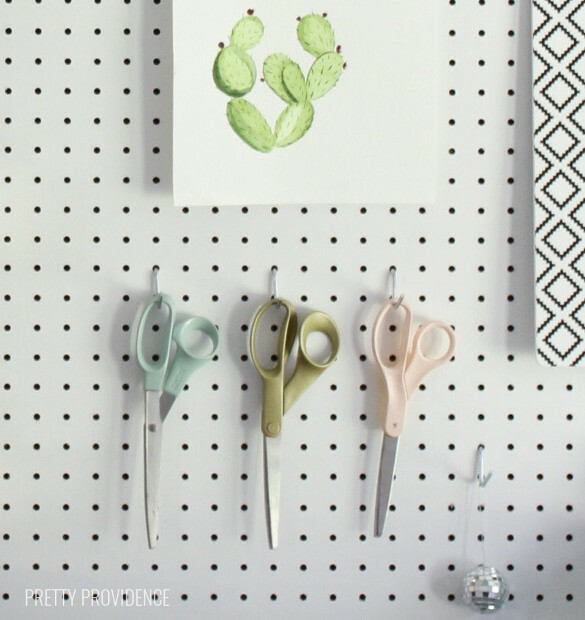 Pegboard – Home Depot (sized to your preference.) Mine was 4×8 feet but I had them cut it into two 4×4 foot pieces for me, and I hung one here. The other half is going in our garage. 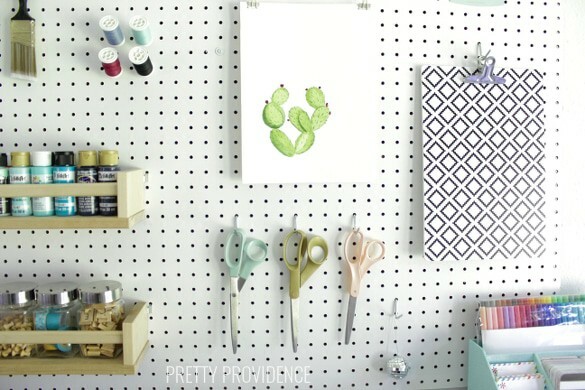 Line up your pegboard on the wall where you want it and choose which holes you are going to use to hang it. (You probably need more than one person for this step!) I chose four holes about two inches in from the corner and then one in the middle. Use a pencil to mark the wall where you’re going to drill into it. 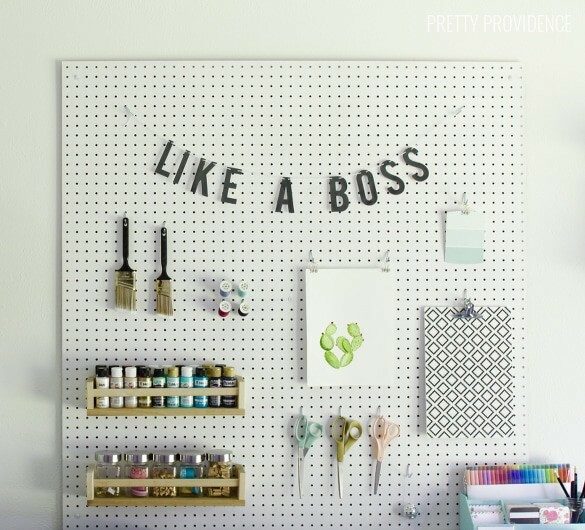 Place pegboard somewhere else until ready to hang. Drill a hole in the wall at each pencil mark. Insert anchors into the holes. Now have someone hold up the pegboard.This is the hardest step because it’s near impossible to see where the anchors are behind the pegboard. (But you can do it, I believe in you!) Slide spacers behind pegboard and hold them in place behind your designated holes, Then place washers on the front of the holes as you drill a screw through each designated hole, through the spacers and into the anchors. You’re done! Now for the fun part. I opted give mine a coat of white paint before doing anything else, because the even though it came white, it was dingy looking. I also painted over the washers so that you don’t notice them unless you look closely. This is up to you, but you’ll need pegboard hooks and it’s probably good to get a variety pack. I also recommend keeping some mason jars or other small containers around that you can tie string around and hang from the pegboard. This is handy for holding pens or small objects. I also got a couple $4 spice racks from IKEA and attached them to some of the pegboard hardware. They hold two rows of craft paint on the top rack and five jars of small craft supplies like washi tape and push-pins on the bottom rack. I love these so much I think I might add a few more. The fact that everything is visible but still organized is SO GOOD. So there it is. I hope you’ll try it! I did spray paint them! They have held up pretty well. It’s been a year and a half and there is some paint wearing off of the edges now but for the most part they still look good! What kind of hooks did you use to attach the spice racks? There are hooks that you can attach to things in the kit of assorted hardware that I bought at Home Depot! Thank you …. I bought my hooks at Home Depot as well but I dont have one that is appropriate to hang that on …or I just cant figure it out =( Do you happen to know which hook you used?? Unfortunately I don’t. I actually had to move my craft room so my pegboard and all that stuff is packed away! I wish I could be more helpful. I made one like this but I built a frame on the back and put 2 eye screws on the top to hang it,so I can move it when I need to..